. . .The garments of the poor old professor I rolled up into a ball one by one and flung out through the open window, far into the marsh past which we were flying in a pitch dark night. Coat, trousers, and waistcoat rested in separate swamps at least ten miles apart. Gray whiskers and gray wig I tore into little pieces, and dropped the bits out of the open window. I had taken the precaution to secure a compartment in the front of the train, and when it came to rest at Parkeston Quay Station, the crowd, eager for the steamer, rushed past me, and I stepped out into the midst of it, a dapper, well-dressed young man, with black beard and moustaches, my own closely cropped black hair covered by a new bowler hat. Anyone looking for Paul Ducharme would have paid small attention to me, and to any friend of Valmont's I was equally unrecognisable. A series of cases ...some solving by themselves ...some with some effort. ..what's most entertaining about the book is the sarcastic differences between the English and the French ways as brought forth by the detective. It's a nice read . I read this for a reading challenge: Read a book with <500 Goodreads ratings. I looked at it and couldn't help but wonder 'why does a book published in 1906 only have 79 ratings?' The answer is apparently because it's fairly rubbish. If you enjoy Sherlock Holmes, you will enjoy this book.podcast. Nice surprise at end. Obviously comparable to Holmes but much closer to a fallible Poirot. 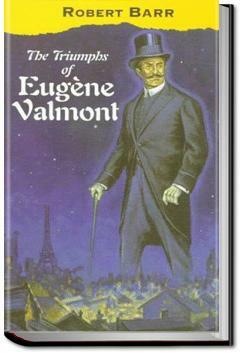 Entertaining because of his failings, Valmont becomes human. Enjoyable.